Suzanna Choffel performs at Padre’s in Marfa during Viva Big Bend 2014. If there’s a description that comes up repeatedly when people talk about the Marfa lights, it’s the way they dance. The color and intensity of the lights vary widely depending on whom you ask, but their darting, dipping, and flickering movements often call to mind some sort of supernatural boogie. Maybe it’s understandable, therefore, that sightings of the Marfa lights spike during the Viva Big Bend music festival, when everyone has music ringing in their ears. Viva Big Bend, which takes place annually in July, features more than 50 bands in 10 venues spread around Alpine, Marfa, Fort Davis, and Marathon. The music fans who journey to West Texas for the festival tend to appreciate its focus on Texas music—roots-rock, country, Tex-Mex, Latin, blues, and folk—as well as the desert mountain landscape and the peculiarities of the setting, such as the Marfa lights. You don’t meet too many strangers when everybody in the crowd shares a love of live music and West Texas. La Tampiquena, which plays a funky mix of honky-tonk and Tex-Mex, will be among the acts featured at this year’s edition of the party. Other highlights include Shinyribs, Butch Hancock, Grupo Fantasma, Chubby Knuckle Choir, Soul Track Mind, William Clark Green, Bachaco, and an “All-Star Tribute to Doug Sahm,” featuring the Texas Tornados, Joe King Carrasco, Kevin Russell, Terri Hendrix, Lloyd Maines, and others. The festival is made up of ticketed events at nightclub venues in Alpine and Marfa, as well as free afternoon concerts at the Gage Hotel in Marathon, the Kelly Outdoor Theater in Fort Davis, the Holland Hotel courtyard in Alpine, and a party on Murphy Street in Alpine. Stewart Ramser, tourism director for the city of Alpine, started Viva Big Bend Music Festival in 2012 to drum up summer travel activity, celebrate Texas music, and showcase the range of live-music venues in the region. The event drew about 3,000 people per day in 2014, about 70 percent of them from out of town. Lodging in Alpine and Marfa fills up quickly for the festival weekend, and the demand for rooms overflows through the area. Texas troubadour Butch Hancock, performing at Viva Big Bend with his son Rory. Alpine averages a high temperature of 88 degrees on July 25 (the Saturday of this year’s festival) compared to 94 in Houston and 96 in Dallas and Austin, according to the Southern Regional Climate Center. West Texas is also arid, which is a relief for many visitors accustomed to summer humidity. When the sun goes down and a breeze blows through, the air is surprisingly crisp. Alpine’s average low for July 25 is 63 degrees, which is 10 degrees cooler than Texas’ big cities. The weather is mild enough that Railroad Blues, an Alpine club that has been serving up live bands and cold beer for decades, lights a bonfire on festival nights. The flames cast a warm glow across the club’s gravel yard, which backs right up to the Union Pacific train tracks. The blast of passing locomotives periodically drowns out the rowdy banter rising from the wooden picnic tables. Inside the club, hundreds of musicians’ photos—autographed and framed—decorate the walls. A wooden floor welcomes dancers to the front of the stage, while others gather at barrel bar tables. The festival closes each night at Railroad Blues with music until 1:30 a.m. You can count on a big crowd and a bustling dance floor. The diversity of venues is one of the interesting parts of exploring Viva Big Bend, along with the scenic drives separating the host towns. For those who don’t want to drive, the festival runs a free shuttle between the host towns. In Marfa, Viva Big Bend puts on shows at Planet Marfa, an outdoor bar with a quirky desert vibe characterized by adobe, Christmas lights, and a sunken tipi; Padre’s, a classic nightclub set in a century-old adobe former funeral home; and the Lost Horse, an Old West cowboy dive with stucco walls and an intimate stage. 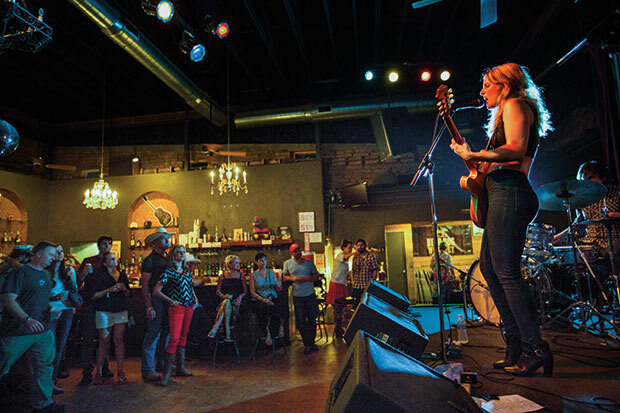 Viva Big Bend features more than 50 bands in 10 West Texas music venues. 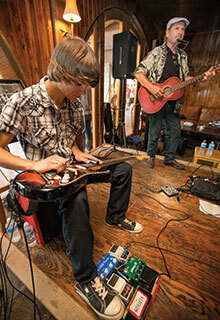 Along with the music showcases, Viva Big Bend organizes events for both musicians and fans to network and explore music, such as instrument and songwriting workshops, and concerts for children. Back for the 2015 Viva Big Bend music festival are the Texas Tornados, pictured here at Alpine’s Granada Theatre. The relaxed nature of Viva Big Bend allows for this type of interaction between participants, be they musicians or fans. Consider the example of Colin Gilmore and Nicolette Good, Americana/folk songwriters from Austin and San Antonio, respectively. The two met at Viva Big Bend in 2013, and now they join forces on occasion for performances and tours. 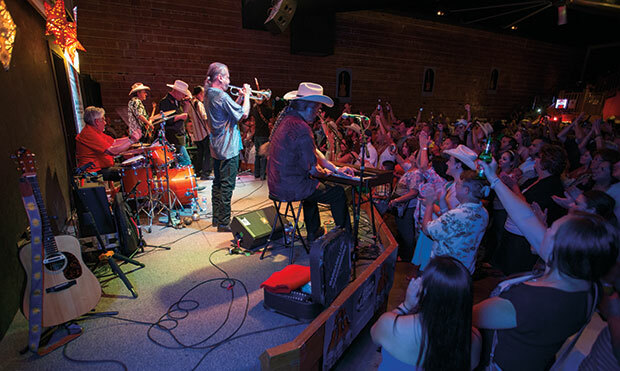 Ramser, who draws on his connections and experience as publisher of Texas Music magazine to book the bands, says some of the performers bring their families and make a vacation out of the trip to Viva Big Bend. And many of them want to return the following year, something he tries to accommodate while also introducing new names. Back for more bands, more new friends, more desert mountains—and maybe, if you’re lucky, more dancing Marfa lights.